AP Photo/Darron CummingsBy Kenneth Teape (@teapester725)Saturday, May 11th, 2013Game 3 RecapFinal Score: New York Knicks: 71 Indiana Pacers: 82The three day layoff between Game 2 and 3 did not play out as the Knicks had hoped as they struggled to do much of anything in Game 3 against a stingy Pacers team to fall down two games to one in the series. Even the return of Amar’e Stoudemire was not enough for the Knicks tonight, who just could not get it going on the offensive end tonight to get a victory. It was a tough game to watch as the pace was very slow and deliberate, playing right into the Pacers’ hands. The Knicks will need a much more spirited effort in Game 4 Tuesday night to avoid going into a deep 3-1 hole in the series.-PositivesStoudemire was able to get through the game tonight without any problems being reported. Being on a strict minutes restriction, Stoudemire was limited to only nine minutes but he made the most of his time on the court. He scored seven points on three of eight from the field, including a three pointer at the end of the third quarter. Stoudemire also recorded two rebounds and was moving very well on the court, showing a lot of activity and looking to be really excited to be back on the court. This should be the capacity we see Stoudemire in the remainder of the series as the strict minute limit will keep Stoudemire on the bench more times than not.The defense for the Knicks tonight was not the problem in them getting the loss. The Knicks actually stifled the Pacers throughout the night, as they went 28-80 from the field and 10 for 33 from the three point line, good for 35 and 30.3 percent respectively. 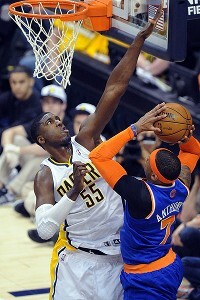 The defense was hounding for the Knicks as well, as they forced the Pacers into 17 turnovers as well. Unfortunately for the Knicks, the defense well outpaced the offense tonight.Going along with the defense played by the Knicks throughout the game, they once again held Pacers All-Star forward Paul George in check. George struggled from the field, shooting four of 17 from the field, and two of 12 from beyond the arc, resulting in 14 points. Iman Shumpert has done an outstanding job on George throughout the series, making him uncomfortable and making things difficult for him on the offensive end, as George was forced into five turnovers throughout the game, giving him 16 total in the series thus far.-NegativesThe Knicks offense was as bad as it could get tonight, as they shot 35.2 percent from the field, going 25 of 71. Carmelo Anthony was the only Knick player to break double-digits, as the rest of the Knicks struggled to score at all. Anthony did not shoot the ball well after a strong start, ending the game six of 16 from the field in big part because of the porous guard play throughout the night. Raymond Felton and Pablo Prigioni combined to go one of 11 from the field and Jason Kidd was once again held scoreless, moving his streak to seven games in a row without a point and 181 minutes played.The Knicks were unable to get into any type of rhythm on offense tonight and a telling stat for that were their three point attempts. The Knicks managed to get off only 11 three pointers in the game, making three of them. The Knicks offense relies so heavily on the three point shot that taking only 11 is not a winning formula. If the Knicks are unable to get better guard play the remainder of the series they will be going home earlier than they had hoped.J.R. Smith was struggling with a virus throughout the day, hitting as high as 102 degrees with a fever earlier in the morning, but he suited up for the Knicks tonight; too bad his shooting was as hot as his temperature. Smith once again struggled with his shot, going four of 12 from the field and zero of three from the three point line. Smith played only 25 minutes tonight and looked to be struggling from his illness but he has been off for a couple of games now so being sick really can’t be used as an excuse. Smith needs to get his game back on track as tonight was a perfect example of how Anthony cannot be the only person scoring for the Knicks in this series if the Knicks want to beat the Pacers.The Knicks were once again hammered in the paint by the Pacers, led by Roy Hibbert and David West. The two combined for 24 rebounds, 13 of which were of the offensive variety. 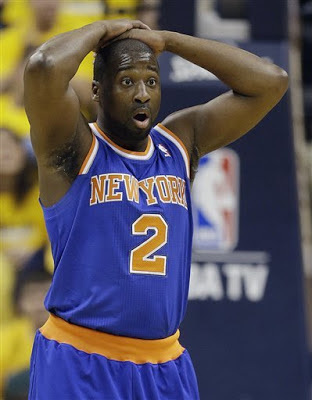 The Knicks as a whole grabbed only 10 offensive rebounds as a team, as the Pacers grabbed 18. On the night, the Pacers outrebounded the Knicks 53-40. Hibbert dominated Chandler once again as his size is something that Chandler is having trouble contending with. Mike Woodson will have to make some changes to get the Knicks back on track as in Game 2 the Knicks actually outrebounded the Pacers. Marcus Camby is one player who Woodson should turn to to help the Knicks in the middle and balance out the size difference the Pacers hold over the Knicks.